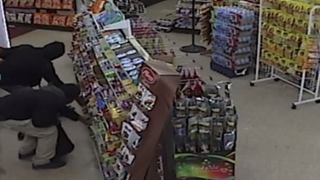 Surveillance footage from an Indianapolis convenience store shows two looters in action. Indianapolis teen Jonathan Ratcliff had three things working against him when authorities say he shoplifted at a convenience store: surveillance footage, a responsible mom and his homework. According to Fox 29, Ratcliff, 18, was one of several suspected shoplifters who raided area stores, taking candy, snacks and anything they could jam into a bag before running out. Ratcliff's mom saw what she believed to be her son's image on the news and called Indianapolis Metropolitan Police to turn in her son. Police were happy to get the call but believed that they had been closing in on Ratcliff after one of the alleged shoplifters reportedly threw his backpack at a gas station attendant during one of the looting sprees. According to WTTV, the name on the homework assignment inside the backpack: Jonathan Ratcliff. Once Ratcliff arrived at the precinct, police say, he provided officers with enough evidence to charge him with theft, Fox 29 reports. The news station reports that Ratcliff is just one of a reported group of young men who have looted area stores. One store owner hopes the teen's arrest will cause the rash of spree-looting to end. "It's like 500 to 600 dollars each time, you know?" the store owner told Fox 29. "There's seven kids and they keep doing it. They never stop." Police are hopeful that news of the teen's arrest with his mother's help will help spread the message. "We know that the message is getting out there," Indianapolis Metropolitan Police Sgt. Kendale Adams told Fox 29. "We know this is an example for citizens to see: When you see something, do the right thing. Do like this mother did in turning her son in." Read more at Fox 29 and WTTV.